Want to surprise your friends and family with bakery-style banana bread fresh out of the oven? Then, this is the recipe for you! My New Years resolution was to get better in the kitchen. So I have been testing and tweaking baking recipes in an attempt to master some of the bakery-style classics. Banana Bread was my first recipe to tackle. After a few tries and with this banana bread recipe, I knocked it out of the park! My taste testers all agree as well with “Oh gosh, it tastes as awesome as it looks!” exclaimed one such taste tester after their very first bite. 1. Preheat oven to 350 degrees and spray a 9×5 baking tin and set it aside. 2. In a large mixing bowl, mix the sugar, vegetable oil, melted butter, eggs, and vanilla. Add the mashed banana and mix until just combined. 3. Mix together Whole Milk and Cream of Tartar – To ensure that the mixture doesn’t get lumpy, mix cream of tartar with 2 tablespoons of whole milk. Once mixed, add to the rest of the cup of milk. 4. In a medium mixing bowl, whisk together the flour, baking power, and salt. Alternate adding the dry ingredients and the whole milk/cream of tartar mix to the banana mixture. 5. Fold in any chocolate chips or nuts. Do not over-mix! The batter should be a bit lumpy – that is what you want. 7. Remove from oven and allow to cool for about 10 minutes before removing from tin and wrapping in plastic wrap to maintain moisture. 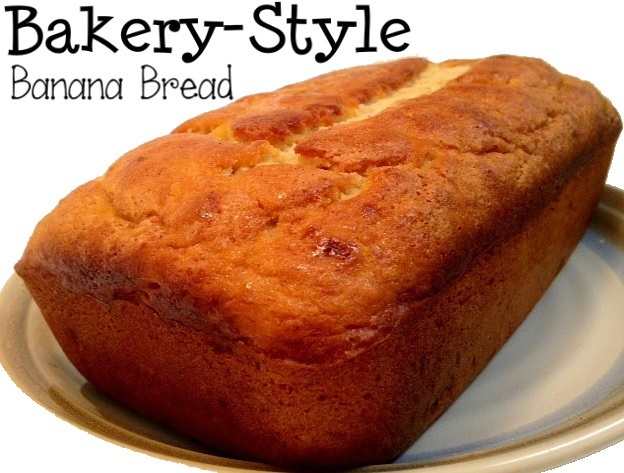 There you have it – A beautiful Bakery-Style Banana Bread loaf that will have all your loved-ones smiling! This entry was posted in In the Kitchen, Rachel's Corner and tagged 9x5, amazing, bakery, bakery style, baking, Banana, banana bread, beginners, best, bread, delicious, easy, eggs, flour, great, kitchen, loaf, milk, recipe, style, whole. Bookmark the permalink.